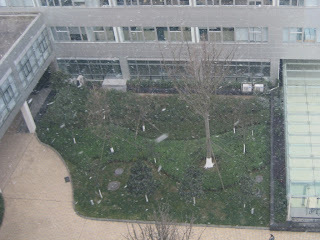 It has been snowing here in ChengDu every day for a week or so now. Driving sleet, freezing temperatures and a blanket of snow across southern China have paralysed trains and aircraft, stranding tens of millions of people trying to get home for the biggest holiday in the Chinese calendar. Luckily, the weather in ChengDu is not too bad considering what everyone else seems to be getting. 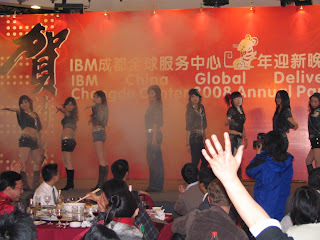 One thing that is strange about ChengDu (and a lot of southern China) is that buildings here don't have heat. I guess someone in the government decided that buildings built in the south do not need heat. Anyways, what we have here is air conditioners that can generate a small amount of heat if you turn the temperature on the thermostat up. There's a couple of problems with this... First, is that air conditioners don't generate heat as well as they generate cold air. The second thing is that the air conditioners, as well as their thermostats, are located up near the ceiling... so you end up with a warm top half of a room and cold lower half of the room. Not the best way to heat a room during the coldest winter in fifty years. In the past three years, the company has hired some 90,000 people in low-cost countries including Brazil, China, and India. 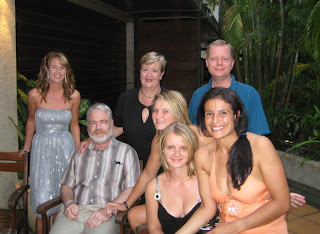 These people, working in so-called global service delivery centers, provide a wide array of services for clients. The work goes beyond software programming to include data center operations, help-desk call centers, financial accounting, and benefits management. Initially, cheap labor was the big attraction of this move, with pay in India 70% to 80% lower than in the U.S. But these days, tapping the abundant talent pools—and new ideas—in emerging markets such as India and China is important as well. 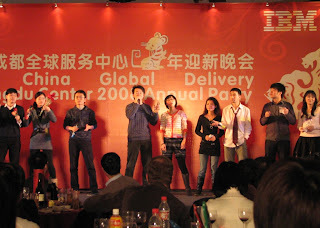 On Sunday evening we had a party to celebrate both the Chinese New Year and IBM Global Delivery's one year anniversary in ChengDu. 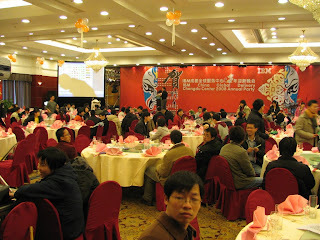 The party was held at the YinHe Dynasty Hotel and we had about 400 or so people attend. 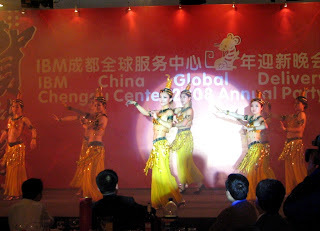 The party started with a meeting (it is IBM after all). ...Another good reason to celebrate! After the meeting we had a very nice dinner. I had a great time. They really need to move the parties to Friday or Saturday nights though. It's pretty hard to get up and go to work the next day. Besides the annual party we had snow on Sunday! It snowed Sunday morning, all day on Monday and in the morning on Tuesday. 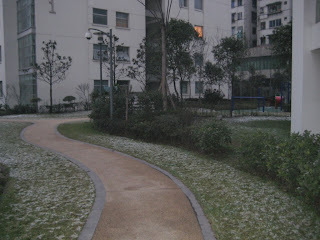 Some people here said it has not snowed in ChengDu for 5 years, others said 10 years. Luckily it was too warm for it to stick. ...But there is one place where fortune cookies are conspicuously absent: China. It's a pretty interesting article. I guess the real reason there are no fortune cookies in China is that there are no Chinese restaurants here that are run by Americans or Japanese. 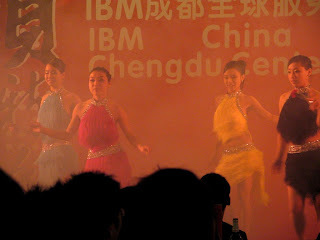 I've been back in ChengDu for a little more than a week, and have been getting back into the groove of things. The weather is colder than where I went on vacation, but not freezing. This morning it was cold enough that my breath was misting when I walked outside. Not too cold, but it feels very cold to me today. Most of last week was spent catching up on my work. 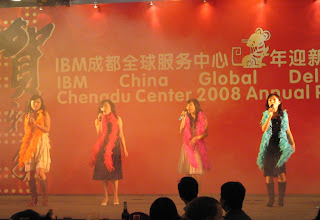 In the middle of the week I was suppose to be interviewed, along with some other foreigners at IBM, by a local TV station about ChengDu but I did not feel well enough. I got a small case of food poisoning. Ugh. Another chance at stardom dashed! Anyways, I was feeling better by the end of the week and went out dancing with Lisa on Friday night, but ended up not getting to sleep until 3:00am. I had a lot to do on Saturday too! I went downtown for lunch and to buy groceries. Reese came over in the afternoon and helped me with my Chinese... 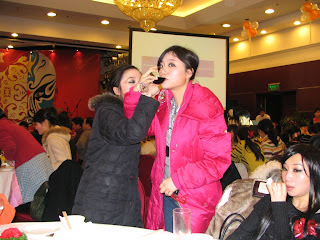 Trying to learn how to read and pronounce items on Sichuan menus. 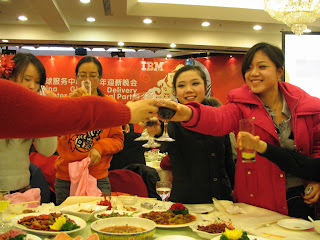 We then went to visit a gym where IBM employees could get a discount. It was nice, but I already have a tiny gym at the apartment, so no real reason to go. The only thing that would make it worth it was that they had Kendo classes. Hmm... I might join just for that. That evening I cooked dinner for Reese, and the dish I cooked was Skillet Penne and Sausage Supper. I had to change some of the ingredients, since it is hard to find Italian turkey sausage and spinach is not in season here now. I replaced those with ground pork and some leafy green vegetable (which I do not have an English name for) that would wilt when cooked. I had cooked this dish before in Dalian for Kaoruko. I know Kaoruko liked it since she had seconds, but Reese had thirds so I'm sure it's good now! I do not know how Reese (who is so slim) can eat so much food! We had some good food, some good wine, and watched Ratatouille (with Chinese subtitles). Reese got to have a new dish and see a good movie she had never seen before so it was a nice way to spend the evening. Sunday was my lazy day, so I just stayed at home, did laundry, and read a book I picked up while on vacation. One of the other things that seemed strange to me in ChengDu when I returned from vacation was the traffic. 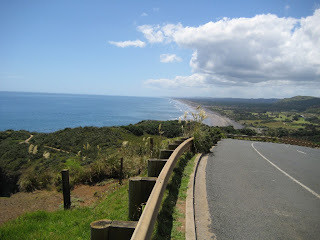 I got a little use to the places I had visited during my vacation where they drove on the wrong (left) side of the road. Mix switching back to being on the right side of the road, along with the crazy traffic here, and it did take a little getting use to again. This morning a lot of the traffic lights downtown were out, so traffic was worst then normal. At one intersection two buses decided to try and cut each other off while making turns and ended up gridlocking both lanes. When we eventually made it out of the city and came upon a traffic light that worked there was a taxi that decided it was ok to run the red light and took out a motorcyclist. Ouch! Since I had an early flight from Hamilton Island I had to get up really early when I left Lindeman Island. I had to leave before the first boat came into the island, so I walked up to the little airstrip on the island and took a 15 minute flight on a little airplane to Hamilton Island. From there I flew to Cairn. Our flight out of Cairn was delayed about two hours due to a mechanical problem, but we were only an hour late when I arrived in Hong Kong that evening. I wasn't exactly sure what I was going to do the next day, but a whole day traveling was very tiring, so I ended up going right to bed after I unpacked. 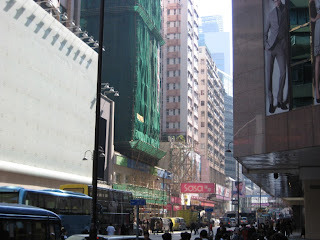 After waking up the next day I decided to spend the day shopping, so after breakfast I logged onto the internet to get some info about shopping in Hong Kong and found this handy little article called A complete guide to Hong Kong shopping! 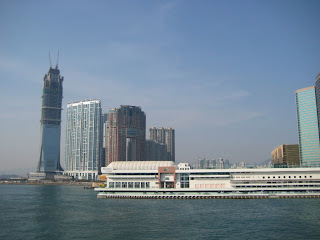 Hong Kong has a really nice subway system and after checking out the guide and a map I decided to head over to Tsim Sha Tsui, which was only one subway stop from the hotel. I spent pretty much all day shopping in this area. I bought some nice sweaters and some black designer jeans. I was also looking for shoes, a new watch, and some sunglasses; but couldn't decide which I wanted. I even stopped by a few tailor shops, but decided I had enough suits already. While wondering around looking for sunglasses I visited a little shop off of a side street and they didn't have the glasses I was looking for either, but the guy there said if I could wait a day he would make them for me. Cool! We sat down and I picked the lenses and frames I wanted. The lenses are a dark grey, and the frames were black wire flex frames with a slight tint of blue. The shape of the lens are perfectly round, and the guy working at the store said sunglasses like them had not been in style in ages but that's what I wanted. The reading glasses in this style are popular, and he said they use to call them John Lennon glasses, but now they're called Harry Potter glasses. After shopping all day I found myself a nice little restaurant called Dan Ryan's of Chicago and decided to have a steak. I had the striploin, which is a sirloin strip steak (I think). It was great, especially with a big glass of merlot. 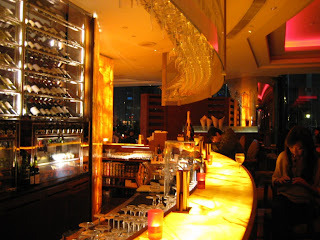 After getting back to the hotel I went to visit the wine bar they had there and tried a few different wines. 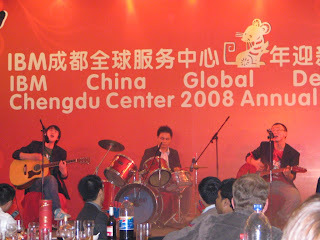 They had a band from the Philippines playing some rather laid back music, so it was a nice relaxing evening. So I was sitting there with Michelle Yeoh and Ziyi Zhang and we were talking about Hong Kong and mainland China, and then... then... I woke up. Drats... Just a dream, but I was ready to head back out shopping and find as many beautiful rich stylish Chinese women, err... find as many good shopping deals as I could! This is so much fun! 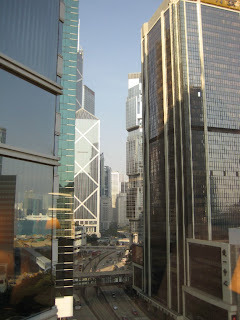 Second day of shopping in Hong Kong and I decided to go to Pacific Plaza, which has an entrance right under my hotel. I ended up buying some real nice gloves and a suede shirt/jacket. I then went back to the glasses store and picked up my new sunglasses that I had ordered the day before. It took me awhile to find the place. They were perfect! I still couldn't decide on a watch or shoes. I found a really nice Armani jacket that I liked, but they did not have it in my size. I found one place that had great deals on leather jackets, but I have too many leather jackets as it is, so I didn't get any. I did end up picking up some books in English for some friends back in ChengDu. 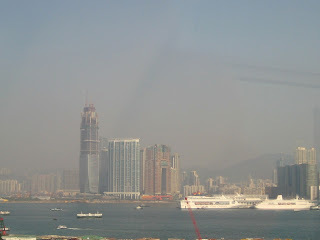 I really like Hong Kong. 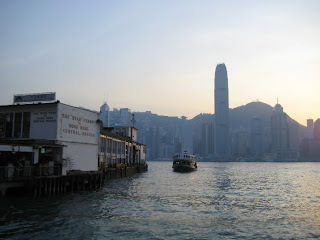 I would love to live there, but I would have to learn Cantonese which is probably harder to learn than Mandarin. 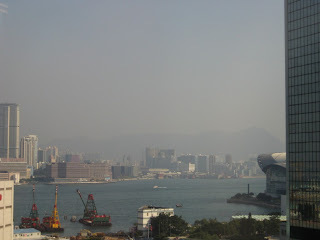 At first it even felt a little strange being in a Chinese city that I didn't feel so foreign in. No people gawking at us foreigners, civilized driving, clean streets, people not spitting or urinating in public, quality service and quality products, well mannered citizens, beautiful rich stylish Chinese women, etc... Everything that I hope that mainland China will one day evolve into. They even have a Morton's of Chicago! My last day in Hong Kong and there were a few things that I wanted to buy that I couldn't find, but luckily the airport in Hong Kong is like a big shopping center too! I found a nice watch, some good Japanese cigarettes, some Armani cologne, as well as some perfume as a gift for someone back in ChengDu. I didn't get to check out the shoes since my plane was boarding. A nice short three and half hour flight, and I was back in ChengDu. After I got home I chatted with some friends to let them know I was back, and also started on the huge pile of laundry I had brought back with me. I was very much in need of some Sichuan food, and I was lucky enough to have Reese join me for dinner that night and we went to a hotpot place near my apartment. I had just spent two weeks without spicy food, so it was wonderful! So I ate too much (especially sweets), had too much wine, got too much sun, spent too much money, but it was a wonderful vacation and now I'm glad that I am home in ChengDu. Just another month until Spring Festival! 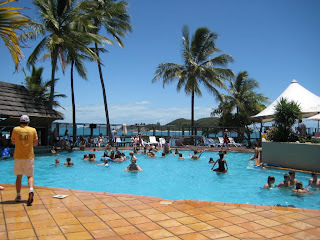 Thursday morning after Christmas and I caught an early flight to Sydney where I caught a connecting flight to Hamilton Island, which is in the middle of a group of islands called the Whitsunday Islands which are around the Great Barrier Reef in the northeastern part of Australia. 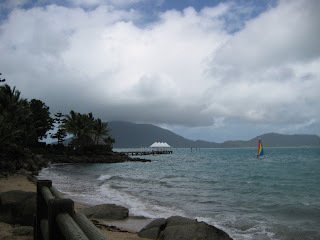 There was a light rain when we arrived at Hamilton Island, but it was so warm out I did not mind. From there I caught a boat for the half hour trip out to Lindeman Island. 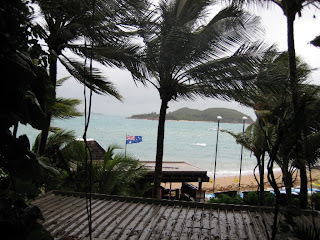 It had been raining for a few days at Lindeman Island and it would continue to rain for another day. 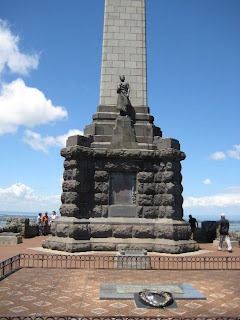 I did not mind too much since I had gotten a bad sunburn in New Zealand, but not much was happening since a lot of the activities there are outdoor activities. One person I talked to who worked there said it was the worst weather he had seen all year. I spent the time exploring the resort and the island, and just relaxing. Eventually the rain stopped and eventually the sun came out. A bunch of these ugly birds were everywhere. 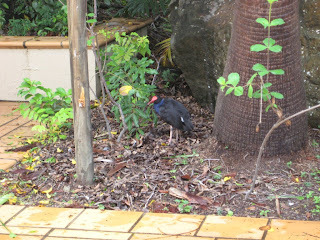 A swamp hen? The day the weather cleared I had no particular plans, but it turned out to be a busy day. 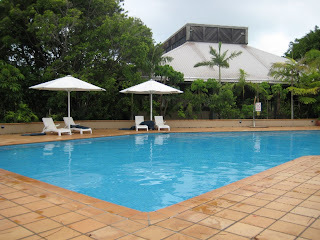 I woke up early and after breakfast I went up to the adult pool, and did a little swimming. After that I went back to the main pool area and while waiting for lunch time I met this lady named Vivian. Vivian wanted to go sailing, so we agreed to meet after lunch and take a catermeran out. For some reason I thought Vivian had gone sailing before, and I have not gone sailing in like 35 years, so we really had no idea what we were doing. It was pretty funny... 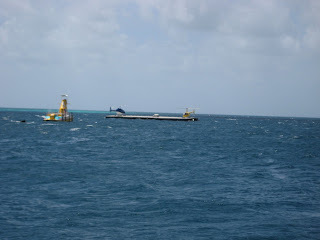 The first part of our sailing adventure went well, and with the high winds, we were zooming along in our catermeran. Coming back though was where we ran into problems. What happened was that we got a little too close to the shore and while trying to avoid some rocks we ended up capsizing the boat and getting pushed into the rocks by the current anyways. The sailing shack staff saw us go in, and quickly rescued us. Just a few scrapes and bruises, but it was very exciting and we were laughing the whole way back to the sailing shack! 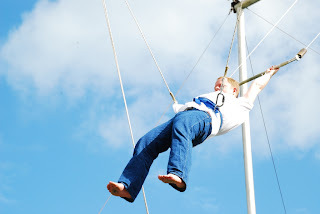 After sailing I went up to the circus workshop area and tried out the trapeze. 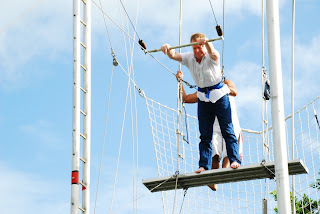 It seemed a lot harder than it looked, but it was a lot of fun. I guess I am not as flexible as I use to be. 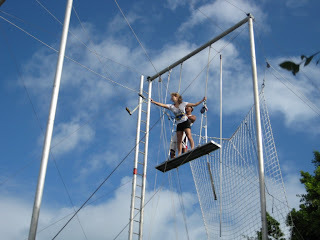 Who let this person go on the trapeze?! 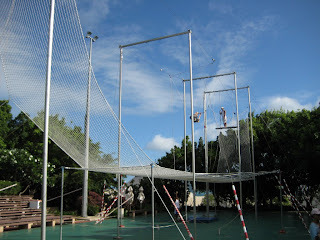 After practicing on the trapeze for awhile I went over to the archery range and shot some archery. I finished up at around dinner time and after eating dinner I joined some others around the main bar area for a few drinks. 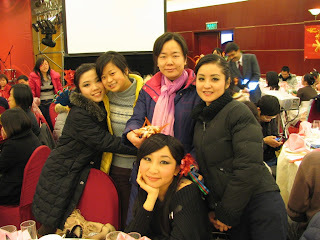 Some of them wanted to go out dancing that evening but I had to get up early the next day, so I didn't stay up too late. 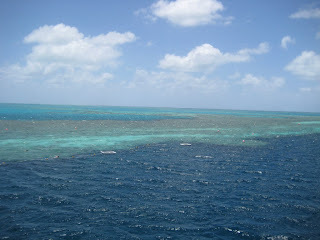 The next day a bunch of us went on an excursion out to the Great Barrier Reef. 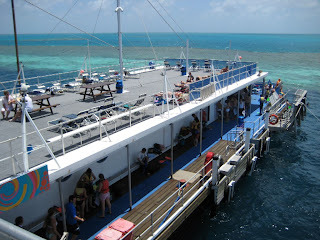 We ended up going to a place called ReefWorld, which is like a large barge anchored out on the reef. 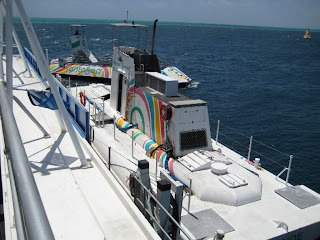 There was a lot to do out on ReefWorld... snorkeling, scuba diving, underwater observation deck, sun deck, semi-sub rides, etc... We took a big boat out to the reef and part of the trip had some very rough seas. 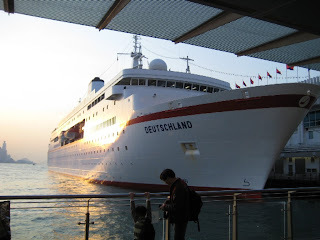 A lot of the people on board got sick, and a lot of the kids were crying. 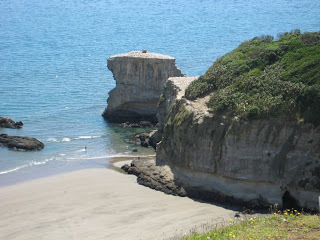 I actually thought it was rather a lot of fun smashing into the waves and going up and down! Sort of like an amusement park ride. Weeee!!! 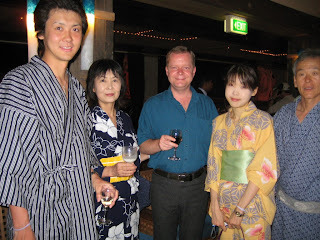 While going out to the reef I met up with a Japanese family and we ending up hanging out together most of the day. 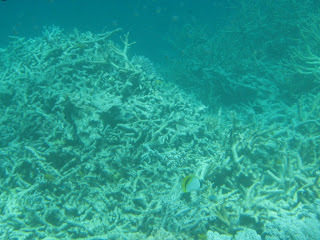 When we arrived at ReefWorld most people went out scuba diving or snorkeling right away, but I decided to explore the place some first. I also wanted a cigarette, and since we weren't allowed to smoke out there it took me awhile to find a place where people were going to sneak a quick smoke. 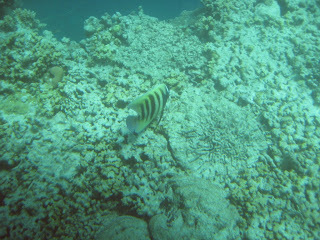 Eventually I went and got all of my diving gear and went out on the reef. It was really nice and after doing that for about an hour I went and had lunch. 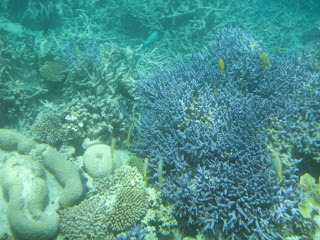 After lunch I wanted to go out on one of the semi-subs to see the reef that way. 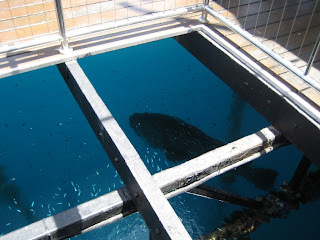 A semi-sub is sort of like a glass bottom boat, but the cabin that you go into inside the sub is almost all underwater, so you can get a good view of the reef around the sub. The first couple of times that I tried to go out on one of the semi-subs the line was too long, so I spent some time hanging around waiting to get one one and got on the last one of the day. After the ride around the reef on the semi-sub we jumped back on board our ship to go back to Hamilton Island and catch another boat back to the resort. 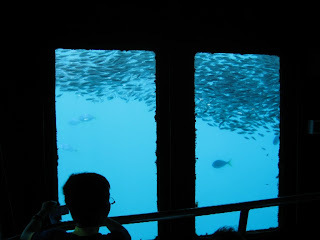 This time more people took their sea-sickness pills and enjoyed the ride as much as I did! Well, maybe not as much as I did. Weeee!!! Actually, all that bouncing around on the boat made me pretty sore all over. Luckily I had scheduled a massage for the next day at the spa. What I got was called a revitalizing marine body wrap... a full body exfoliation using micronised marine sediments with a relaxing full body wrap followed by a hour-long massage. It was a great way to end the year! For New Years they had a big party out by the main pool, but I just hung around with some friends and wasn't really into all the noise and stuff. I didn't do too much on New Years day. Pretty much just hung out and chatted with people. It was kind of funny to see who was hungover and who wasn't. A lot of the staff seemed to have stayed up extra late, since most of them could not party until most of the guests had gone to bed. 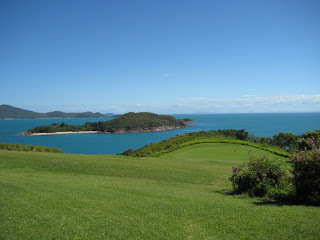 On the day after New Years I played a few holes of golf on the little golf course they had on the island. It was very hot out on the course, but I took extra care not to get sunburned again... mostly by hitting my ball into the trees where it was shady. Hehe! 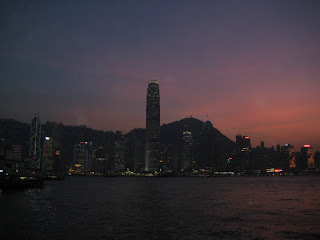 The next day I had to get up early to catch my flight to Hong Kong. 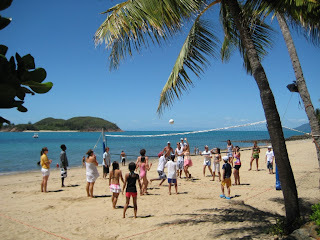 A quick note about the Lindeman Island Club Med... This is definitely a family oriented Club Med. There are a lot of kids here and a lot of things, such as the food, is geared toward them. They also have the most restrictions on smoking that I have ever encountered at a Club Med before. 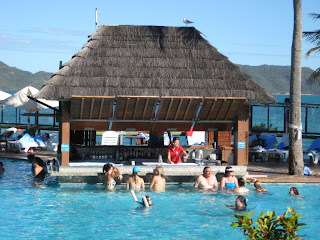 Although I had a great time at Lindeman I preferred all of the other Club Med's better than this one. If you smoke, do not have kids, and/or looking for a wonderful dining experience all the time then this particular Club Med might not be for you. 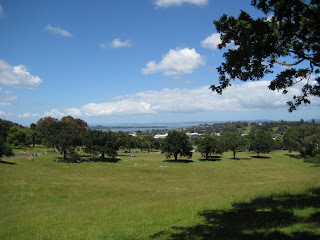 On Christmas day we went over to some friends of Leola and Lloyd's. There were about 7 people there all together and I don't remember all of their names (sorry). We spent a relaxing afternoon chatting and eating. It was very nice. We had lamb, turkey, waldorf salad, mashed potatoes, sweet potatoes, etc... and some other vegetables that I forgot the name of. For dessert we had something I've never had before called Pavlova. Yummy! 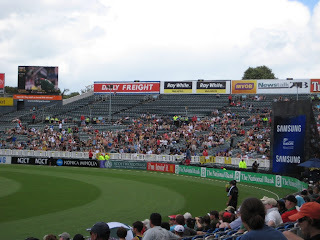 The day after Christmas is called Boxing Day in New Zealand, and we spent the early afternoon at a cricket game. 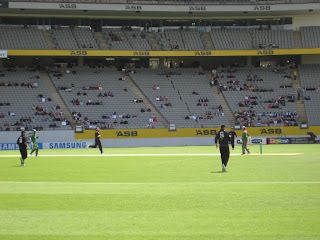 The New Zealand team was playing a team from Bangladesh. I've never really watched cricket before, and Lloyd did a good job of explaining the rules. One thing I learned was that a cricket match can go on for a long long time. We spent about four and a half hours at the game, and I think the game actually lasted about seven or eight hours. And that was a short game! 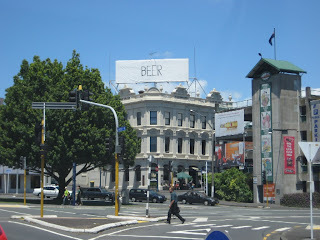 New Zealand won, by the way. After the game I took a little nap. Being out in the sun really drained me. After that we went over to some neighbors of Leola and Lloyd's. We ate lots of sweets and drank some wine. 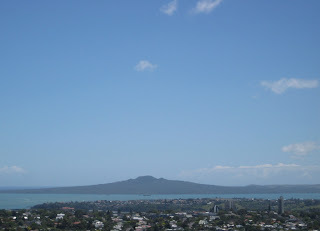 Even with the overdose of sugar and having sunburn set in I had a great time in New Zealand. Off to Australia the next day!